Slotty Vegas Casino is run by Max Ent Limited and is recognised as one of the most reputable online gaming destinations. Established in 2014, it offers a wide range of slots, slick graphics, and innovative features. This Slotty Vegas review takes an in-depth look into what the casino has to offer. It’s important that players familiarise themselves with the terms and conditions set by the casino. These are all listed in the Terms of Service section which can be found on the home page. The casino reserves the right to suspend a cash-out request pending investigation of the user’s identity, age, and location. The user will not use the service for illicit or fraudulent activity, or for any unlawful or fraudulent transaction (money laundering). If the casino suspects anything, they reserve the right to block their account. Only one account per customer, household, address, shared computer, and IP address will be allowed to sign up to Slotty Vegas. Failure to provide proof of identity could lead to the closure of a customer’s account. Opening a real money account will only be granted to individuals who are 18 years or over. Slotty Vegas reserves the right to shut down a player’s account without a refund if they suspect that the account details were disclosed to a third party. If the account holder does not access their account for 12 months, it will be deemed inactive. The casino holds rights to charge an admin fee of £5.00 per month for accounts that are inactive. It is essential for an online casino to be fully regulated and controlled. Slotty Vegas holds a dual license from the Malta Gaming Authority and also the UK Gambling Commission. It is a legal obligation set by the gambling authorities for Slotty Vegas to promote good gambling practices. These regulators ensure that gamers are protected from any fraudulent activities. Regular audits take place to ensure that all policies are adhered to. Remember: never trust a casino that doesn’t hold a valid, reputable license. 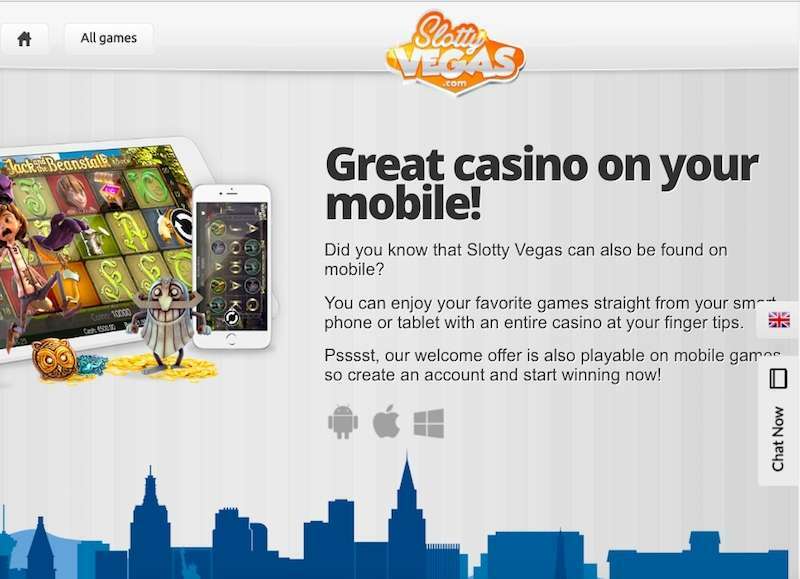 Slotty Vegas is available in a no download version of the site for mobile devices. Players can log into their accounts using their favourite browser and play games within seconds. Android, iOS, and Windows are all supported. This feature is of particular benefit for gamers who wish to enjoy the casino on the go. 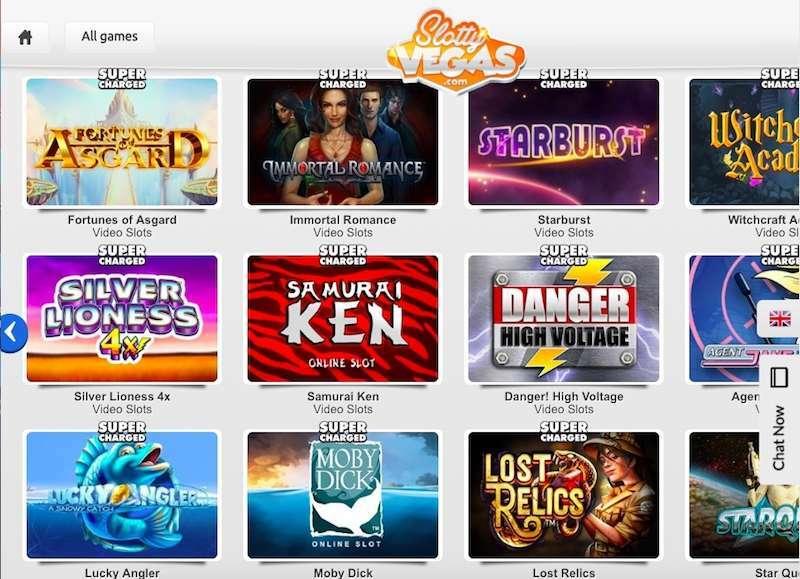 Customers can enjoy Slotty Vegas play online at any time of the day. Plus, all mobile games are supercharged, so players don’t have to be afraid of missing out the deal. The casino utilises the latest 256-bit SSL technology which protects players’ data. All information that is obtained while signing up to the site is kept safe and secure. The same applies to all banking information and details. In order to know the privacy aspects in greater detail, you have to head to the Privacy section on the home page. There, you will find all relevant details to ensure that you can feel safe and secure while placing the personal information on the site. Slotty Vegas’ customer support team is available 24/7. The most convenient way of receiving help is probably through the live chat option. To speak with an agent, simply click the Chat Now button at the right-hand side of the screen. Customers can also email to the support team, bearing in mind it will take slightly longer for a response. It is advisable for gamers to check out the FAQ section before getting in touch with an agent. Most questions will be answered there, and it saves the hassle of waiting for a response. Alternatively, it is possible to follow the casino on Facebook where customers will be kept up to date with the latest news. The casino takes the issue of responsible gambling very seriously. There is a separate page dedicated to this issue. Here, there are questions for people to help them identify if they have a problem. Players can also set betting limits and self-exclude from the casino when they hit the threshold. There are also links to counselling groups. Slots – Slotty Vegas is heaven for slot fans. NetEnt and Microgaming – who are the world’s leading game suppliers – both provide slots for the site, allowing everyone’s favourites to be under one roof. There are smaller software providers as well, so players will have a wide selection of the best games. Popular hits include Fruit Spin, Deco Diamonds, Twin Spin Deluxe, Gonzo’s Quest, Highlander, Jungle Spirit, and Immortal Romance. The casino has implemented a new feature – volatility rating of each game. This will enable players to pick a game according to their risk aversion and playing style. Table Games – There are 26 table games in total at Slotty Vegas, and these include roulette, blackjack, pontoon, baccarat, punto banco, red dog, and poker. These games are divided into two sections: The Classics and Other. Live Dealer Games – Players wishing to experience a live casino without leaving their home can do so by clicking on the Live Casino section. Here, gamers will be able to interact with live dealers and fellow players as they play the classic casino titles. These include roulette, baccarat, blackjack, and poker. The bonus funds have to be wagered at least 30 times within the seven days of your first deposit. All free spins must be used within the seven day period as well. Any winnings that come from the free spins must be wagered at least 20 times. Players who receive the free spins must wager the value of their deposit at least three times in order to withdraw any winnings. Gamers who deposit using Skrill or Neteller will not be eligible for the welcome bonus. Gamblers from these countries will not qualify for the offer: Canada, Estonia, Bulgaria, Portugal, Mexico, United Arab Emirates, Latvia, and Lithuania. It is advised to check the list of games excluded from the bonus since not all of them contribute to the wagering requirements. All players are eligible for Supercharged winnings. Every player’s game selection is taken into account, and some games are Supercharged more than others. The Slotty Vegas information system will be aware if you haven’t been lucky of late. They will then increase your Supercharged rate, and your possible winnings will be bumped up even further. 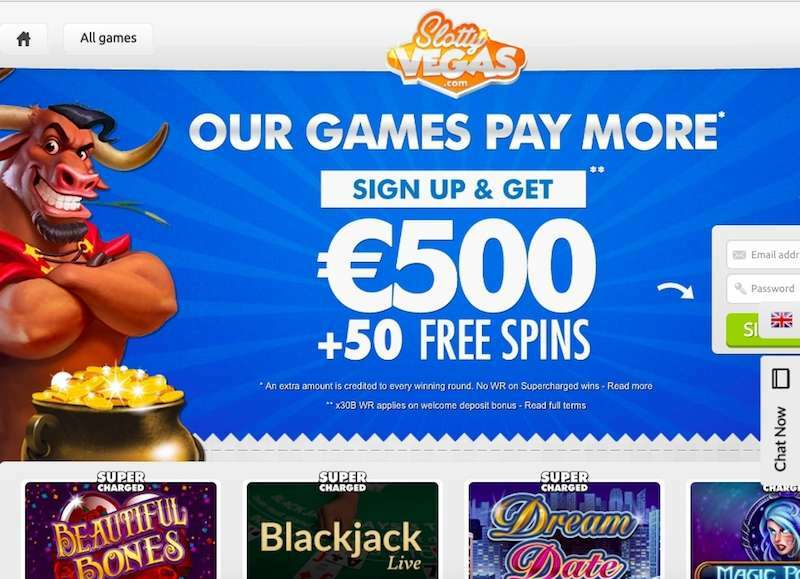 There are terms and conditions that apply to bonuses, and these can be found on Slotty Vegas site. They state that Supercharged Bonuses are credited as cash, and can be claimed twice a week. But they bear the status of ‘gift’, and players have no legal claim towards these funds. So, please, be aware of the applied Terms and Conditions before committing yourself to any offer. Credit or Debit cards – These are the most popular form of depositing funds for players. The casino allows transactions from different banking providers, and there’s a long list of bank cards that you can use. These include Visa, Mastercard, Maestro, and Visa Electron. There is a minimum deposit limit of £10 per transaction. The maximum is £10,000, and all transactions are processed immediately. It is advisable to check banking providers to ensure there are no hidden charges. E-Wallets – There is also an opportunity to deposit funds using digital wallet methods. These include options such as Skrill and Neteller. These methods will not incur any additional fees when you make a deposit. However, it’s always best to check the terms and conditions just in case they change. Vouchers – If players want a higher degree of privacy, then there is the option to use vouchers when depositing funds. This method is always a reliable option as there is absolutely no chance cyber criminals will have access to your bank details. These cards can be bought over the internet and in land-based shops. One method included on the site is Paysafecard. There are also no additional charges that occur when using vouchers. In terms of withdrawals, Slotty Vegas aims to process all transactions within four hours. If players are lucky enough to win a jackpot prize, then it will be paid out over 10 monthly instalments. All other winnings are capped at £25,000 per month. Supercharged Wins – this is a brilliant promotion that can substantially boost your payouts. It’s also something that sets Slotty Vegas apart from the crowd of other online casinos. Even though Slotty Vegas has only been around for a few years, it has already been recognised as one of the best casinos around. And it’s certainly easy to see why. The huge, diverse range of games is the main attraction, and slot fans will especially be pleased with the selection on offer. There’s also the supercharged promotion that makes the casino under review unique. In addition, most sites struggle in allowing customers to withdraw money within four days. Here, a payout time of just four hours will certainly appeal to every customer. Slotty Vegas is a casino number one for me. I have been gambling for more than 6 years, and I tried to play in many casinos, traditional ones, and online. Here, I found everything I was looking for in other places. I can get support at any moment, I can gamble using my smartphone or a tablet when being anywhere, I can, finally, use awesome fast cash out option and choose any method of withdrawal and deposit including my favorite Skrill. My mark for Slotty Vegas is 5 point from five possible ones!